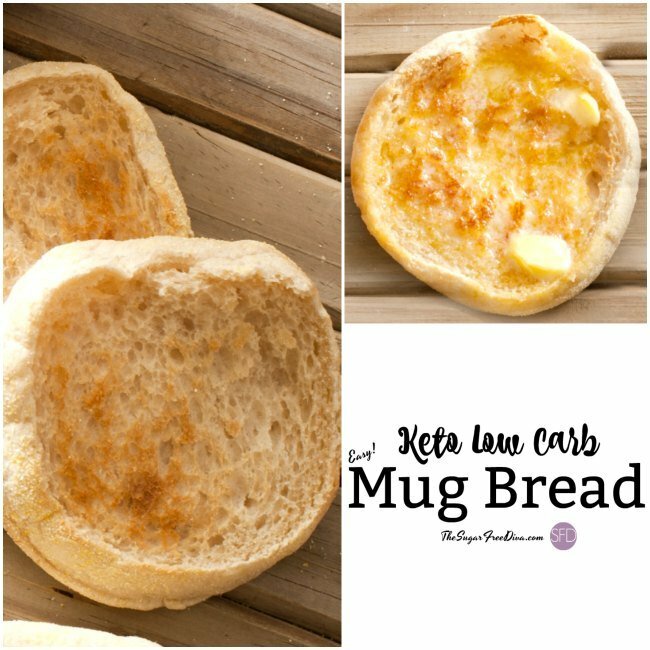 This Keto Low Carb Mug Bread can be made in under 2 minutes! 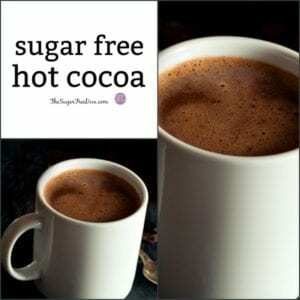 It just takes a microwave-safe mug and a microwave to make it! It seems as if ‘Keto” and ‘Mug’…anything… are the hottest trends right now. At least, to us Pinterest people, they are. 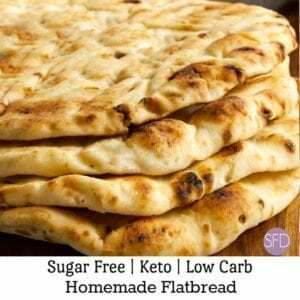 It is not every day that you see a bread recipe for keto diet followers. What I like about this bread is that it is quick to make and you only have to make one serving at a time. I like that there are no leftovers to tempt me into eating more than I should. Keto usually means avoiding flour. 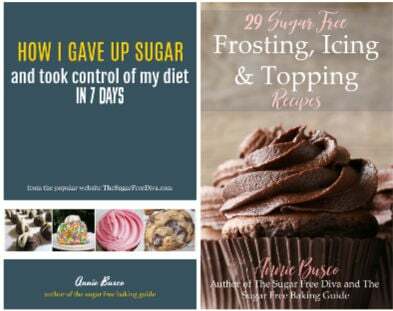 I am an avid..on and off… low carb person and I know all about substituting the in alternatives for regular carb containing all purpose flour. One way to do this is to use on of the other kinds of flour that do not have all of the additional carbohydrates in them. It is no secret that I use Carbalose flour in my recipes. That is because it is so easy to use. There is even a baking mix available for it. Of course, there are other low or no carb options available to use as flour. Gluten free folks know all about coconut flour which is an all purpose flour alternative. Almond flour is another viable alternative as well. 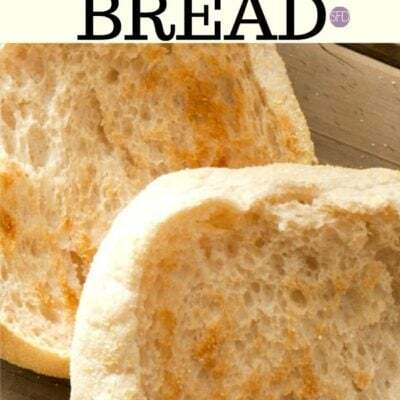 By the way, if you are using these gluten free flours in bread or similar recipes, you will usually need to make up for that lost gluten by adding a binder such as Xanthan gum. However, this recipe is small enough to work without it. I do have some similar recipes that you may be interested in as well. The flour alternatives that you use should be two of the alternatives mentioned above. However, if you have your own go-to low carb flour alternative that is not listed, you can use that one instead. Low carb flour alternative – Carbalose flour – 2 tablespoons . OR 1 tablespoon of coconut flour plus 1 tablespoon of almond flour. Oil- such as olive oil- 1 tablespoon. Optional- grated cheese- 1 tablespoon. Using a microwave-safe mug and a fork, mix together your flours and baking powder. You can spray your mug for nonstick before adding the dry ingredients if desired. In a small bowl, whisk together the remaining ingredients (egg etc). Pour the wisked ingredients from the bowl into the mug and lightly blend together using your fork. Avoid lumps without over mixing. A good idea would be to tap the mug on the bottom to help the batter settle into the empty areas of the mug before baking. Mix enough so that you can get a ‘bread in a cup’ rather than an ‘egg in a cup’. Microwave on high for 30 seconds. Rotate the mug and then microwave for another 45 seconds- 1 minute or until the bread seems baked to the eye. Carefully remove the mug from the microwave and turn it upside down on a plate or cutting board. The bread should slip out easily. However, you may need to give a quick tap to help it out. Slice the bread to your desired thickness. This bread reminds me a lot of English muffins. However, it is not an English muffin. 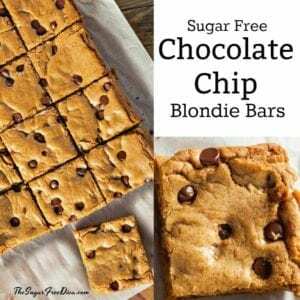 I have had a reader report that she used 2 tablespoons of Almond Flour as her flour in this recipe. She reported good results! Scroll down to the comments to learn more. 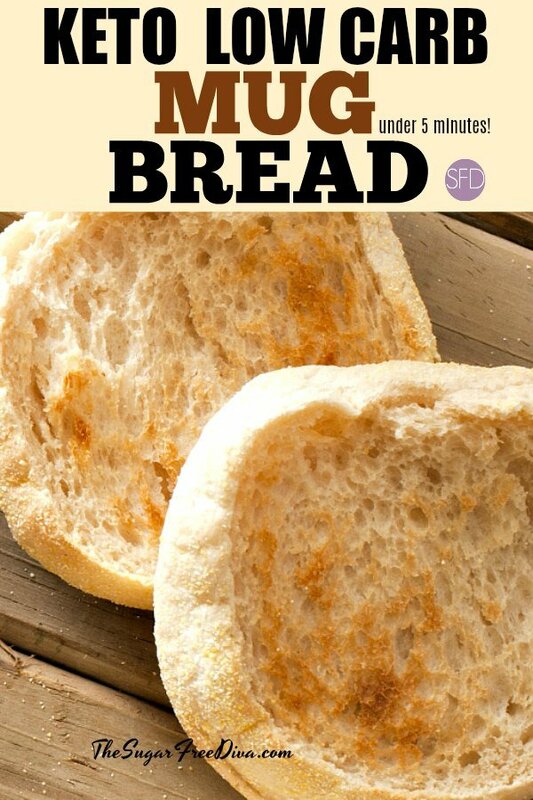 However, this bread can be made gluten free, sugar free, and low carb! YAY! Low carb flour alternative Carbalose- 2 tablespoons . OR 1 tablespoon of coconut flour plus 1 tablespoon of almond flour or other alternative flour is suggested. See other suggestions listed above. Pour the wisked ingredients from the bowl into the mug and lightly blend together using your fork. Avoid lumps without over mixing. A good idea would be to tap the mug on the bottom to help the batter settle into the empty areas of the mug before baking. Mix enough so that you can get a 'bread in a cup' rather than an 'egg in a cup'. See post for details about ingredients etc. What if we don’t own a microwave oven?! Can we bake it in a conventional? What will the timings be and temperature? Hi. This is a microwave mug bread recipe. I suppose that you could make it in something that is oven-proof. I have not tried this in an oven. I suppose that if I were to bake it in an oven I would do so on a low temperature like 325 and watch it carefully.The key of course would be to use an oven-safe container to make it in. If you make it in the oven, please let me know how it goes for you. thanks!! Salt and onion powder. Baked it in microwave. Toasted for some minutes a toaster and had it with some cottage cheese on top. Let me tell u this was way better than i expected. Omg i want to eat one more right away! I am thrilled to hear that this worked for you and for the tweaks that you made. This really is an awesome recipe. 🙂 Thanks for the update! I am a little confused…are you saying to use 2 tbs of alternative flour PLUS 1 Tbs of coconut flour AND 1 tbs of almond flour?? Or is it 2 tbs of alternative flour OR 1tbs of coconut flour and 1 tbs almond flour. Hi. 2 tablespoons of the alternative (see the post above) or a total of 2 tablespoons of coconut flour plus almond flour using 1 tablespoons of both. Thank you!! So it’s okay to use carbalose flour? 2 tbls? Am I reading that correctly? Hi. Carbalose is what I prefer to use because it is lower in carbs than regular all purpose flour. Thanks. Love the easy of this. Tried the first round w/o cheese. Definitely on the dry side, but otherwise tasty. Will try with cheese to add moisture & maybe a little more oil. I see endless possibilities with flavorings for this. Hi. I would add a bit of oil too as well. Thanks for letting me know!! Hi. Go Here To Find Nutritional Values. Thank you! I pressed that Yummly button a whole bunch of times and your recipe did not get added but I found others that are similar to try. If you can tell me how to make it work I will try again. In the meantime it’s really important to have the nutritional information for many reasons. Thank you for a delicious recipe! Hi. I am so sorry this happened to you. I have good luck pressing the button that is on the recipe card itself rather than on top of the post. If you go to this page and scroll down there are other methods available for you to try. thanks! I tried this and it looks nothing like the picture. It just looks like a mug omelette. Hi. Did you use the same ingredients that are listed? Also, mixing the ingredients before putting the mug into the microwave is essential. I was starving and craving bread which i gave up 3 months ago. I thought no way was this going to work having tried every keto bread recipe with no luck. I’ve never been so happy!!!! I think you really have to toast it but it is amazing. Ate the whole thing!!! Thank you so much. One more time. I made this again today for breakfast. This time i sliced and toasted in pan with avocado oil. Topped with a little earth balance spread, fresh sliced strawberries, a little swerve powdered sweetener and sugar free maple syrup. Delicious!!!! Tasted a bit like strawberry shortcake. 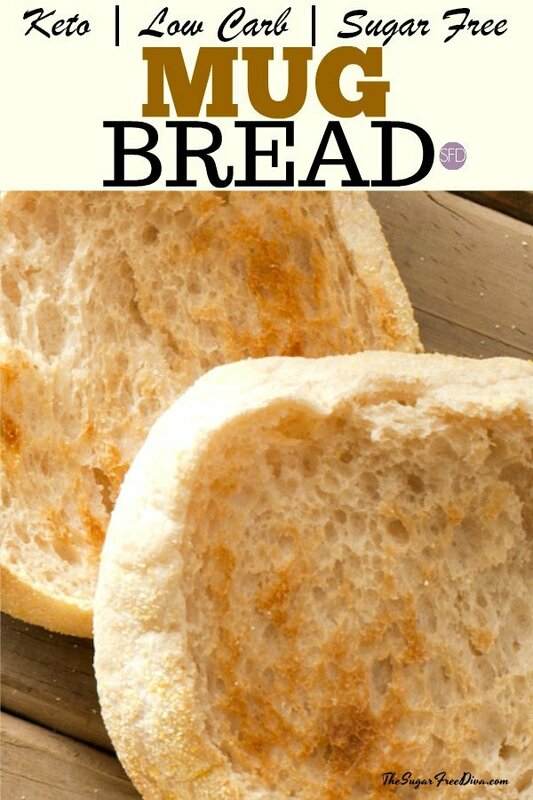 This bread is so versatile and yummy. Thanks again. It looks like cornmeal is dusted on the outside, is this what you used? In the photos the bread has an english muffin shape which I’m not sure can be achieved inside a mug. SO how did you make the english muffin shape? Or are these simply photos of actual english muffins? Are those actual pictures of bread you made? They look like regular English muffins is why I ask, complete with cornmeal on bottom. Hi. Thanks so much for this recipe. The first time that I made it I sprinkled garlic seasoning and added some butter. It turned out just like your photo. And it tasted so good. Then I started to experiment by adding cheese and making it into a bun for a veggie burger. This is the best keto bread recipe I have ever tasted. Thank you so much!! You are welcome. I keep getting great ideas from my readers on how to make this even better! Turned out great. It really tastes like bread too! Allergic to nuts. Can you do all coconut flour? Hi. I would add a bit of Xanthum Gum to the coconut flour. Please let me know how it works for you.thanks! I just bought some almond flour, would I be able to use just the almond flour? Hi. I would add a bit of Xanthum Gum to the almond flour. Please let me know how it works for you.thanks! I used 2 tbsp coconut flour and added some salt and pepper. It came out pretty good, smelled and tasted like a soft sugar cookie! Just wondering if xanthum gum would cut down on the denseness? Or maybe a little more oil? Thanks so much! I will definitely make this again!! I would imagine that xanthum gum would do so as it is a binder that is used instead of gluten. Thanks for letting me know how this worked for you. Could you use Phsyllium husk if you don’t have Carbalose flour? Hi. I have never used Phsyllium Husk in baking so I have no idea. Please let me know how it works for you if you do try it. thanks! I have found this turns out better with shredded mozzarella in it. I made it last night with garlic and put pizza toppings on it. This morning I made it will coconut oil and added cinnamon, vanilla and some Swerve sweetener. It tasted like French toast without the guilt!! Thank you! Please invite me over the next time you make this bread 🙂 Everything sounds amazing!!!!! Thanks!